Let’s give it a thought: how often do you check your smartphone? Every hour? Every 30 minutes? More often? According to comScore’s 2017 Cross Platform Future in Focus report, “the average American adult (18+) spends 2 hours, 51 minutes on their smartphone every day”. And that’s a very sober estimate: there are studies that talk about 4 or 5 hours and more. These findings are not too surprising: in today’s world, mobile devices are an easy and convenient way to connect with the world, to stay informed and keep in touch with your friends and colleagues. Smartphones are usually literally within arm’s reach, which is why so many people prefer using them over desktop devices. According to Statista.com, users downloaded 178.1 billion mobile apps in 2017. By the end of 2018, the number of mobile apps downloads is predicted to exceed 200 billion. Recently, Techcrunch.com presented a report according to which smartphone owners use on average 9 mobile apps per days and 30 per month. Your e-learning platform is now just a single tap away! In Training-Online.eu, we strive to keep pace with current trends and users‘ preferences, which is why we now proudly introduce our new Trainin-Online.eu mobile app. Our goal is to provide the user with a well arranged, uncluttered mobile app interface which would allow them to access their e-learning platform with a single tap on the screen. Training-Online.eu’s mobile app is personalized to every user, meaning you won’t need to log in over and over again. With your e-learning platform always at hand, learning will be easier than ever. Just visit Google Play, download our app in one click and see for yourself! 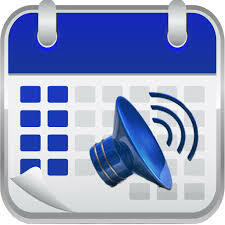 And if you don’t have an Android phone, don’t worry: Training-Online.eu’s mobile app for Apple IOS is coming soon. Accessing your e-learning platform is now easier than ever. Download Training-Online.eu’s mobile app today! Your users may find the course and enroll for it themselves. Training-Online.eu platform offers an option to allow your students and employees to find the courses available in the internal course catalog and to self-register for a course. We call this function “Self-enroll”. Our internal catalog is the full-text search engine where the user may search for the courses by their names, descriptions, course IDs or category. After that, the users self-enroll for it and start to study. If you want to, you can inform your users about a recommended content they are supposed to study, usually by sending them an email with the name or ID of the course, and they should be able to find it, enroll for it and study the content themselves. You don’t need to enter the LMS system to enroll the users to a course! Grouping helps you to manage classes, departments and teams containing more users as logical units and operate all the users as one. Apart from making group enrollments, this also helps you to break down the data in the reporting as you can use the name of the group as a filter. This is a function that enables automatic repeated enrollment of the user for the course. For cases where the periodic study is required by legislation or your internal policy, you may set the repeated enrollment when assigning the course to the user. You may select any period of time by using the day/week/month/year unit. The platform automation ensures that the course will be enrolled at the right time and you don’t need to pay attention to that any longer. Training-Online.eu platform contains the Notification module which is securing the automatic emailing service. When the system is installed, there is a set of predefined email notifications, such as Course enrollment, Course Due, User created, and many more. You may add new ones, or copy and edit existing notifications to maximize the student information level and increase course completion level. The notifications are triggered by your actions: for example, whenever a new user is created, the system sends them the access details or course enrollments with all the necessary details and links to open it. Apart from that, the notifications can also be triggered by a time event: for example, three days before the due date the user is informed about the time remaining for the completion of the course. All notifications may be sent to various recipients, user, activity initiator (teacher) or admin. The email body and the text may be built from the fixed texts and also system variable values, such as names, Course names, dates, etc., which helps to maximize the email personalization and ensures maximum user attention and simplicity of the learning system. In today’s connected world, people expect to have easily accessible information at their disposal. Nowadays, when a new employee comes to a company and wants to learn more about their products, or when a business partner wants to read about the company’s sales practices, they won’t make a phone call or write an e-mail. They will open the company’s knowledge base, which is an online library of information about the company’s products, services, departments, practices and any other relevant topic. A good knowledge base is being updated regularly, so the users always get access to new information and products. This also helps them to avoid asking frequently repeated questions and gives you more time and space to develop your business instead of dealing with FAQ. It simplifies onboarding as it provides them with the opportunity of self-paced learning and helps them to answer many questions. However, the employees aren’t the only people who use knowledge base software regularly. Knowledge bases are being actively used by customers and business partners as well. Just imagine how much time is saved when all of the questions they have can be easily responded by looking the answers up in the knowledge base, or by sending them a simple link. Nowadays, you don’t have to send the same e-mails over and over again and explain the details; using a knowledge base, anyone is able to resolve their own questions, plus they discover more additional information while reading through the material. The McKinsey Global Institute discovered that the use of social technologies, like knowledge management tools, can raise productivity levels by 20 to 25 percent. As a new generation e-Learning platform, Training-Online.eu enables you to create a knowledge base. In other words, it can be used like a knowledge base platform. Thanks to our internal catalogue, users can search for information and add the content they need to study. If using the Free Plan, they can add courses without any financial limitations. What should you add to your knowledge base? Anything you think might be useful for your employees, customers and business partners. All of the information about your products, all of your product sheets, descriptions of services, competitive advantages, sales practices and any other relevant piece of information can be inserted to individual lessons and assigned to courses according to its topic. Keep in Mind the needs of your users! Don’t forget that while creating a knowledge base, you should always keep in mind the needs of your users. The first important part of creating your knowledge management system is to be able to identify those needs. In Training-Online.eu, this can be done easily using the SkillGap and Survey tools. Thanks to the results of these surveys and tests, you will be able to realize which knowledge areas are the most important for your business and where to start. Later, while adding content to your knowledge base, always keep in mind who you’re doing it for – that will help you to give the base a coherent structure in which the information will be easy to look up. If you’re still not sure about how to start, you can read more in A few tips for building your knowledge base. If you need to keep your business partners updated about your products and services, an easy way to do it in Training-Online.eu is to create a Learning Plan for a partner and enroll him/her in the set of courses. That way you can be sure that your partner is using correct and updated information. At the same time, he/she will have access to all the information and can come back to look up other things later. Your time is being saved as your partner will be using the new possibilities of “course self-service”. 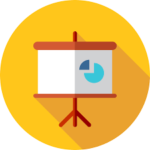 In Training-Online.eu, you can add PDF documents and PowerPoint presentations to your knowledge base. You can also use videos you created before, or you can capture your product or service presentation as video and thus create a video tutorial for your users. While it is not always possible to add files in these formats to other knowledge based systems, it is not a problem in Training-Online.eu. If you want to make sure that your users understood the content and they are now able to use it in real life, Training-Online.eu allows you to complement the course with tests. You can also create a test-less copy of the course which can also be published in the course catalogue. All of the possibilities mentioned above will give a huge competitive advantage to your business. At the same time it’s very simple: anytime you present new products or services, you can add the information about it to your knowledge base. That way, your users will be always updated but at the same time, they can look up the information they need easily. Start by the frequently asked areas. What you can do is to add a new topic every time a user asks a question about it, and to build your knowledge base step-by-step in this way. Don’t forget that building a knowledge base is a long-term business. It will take some time until it’s actually rich and deep. Add information to it continuously and update it regularly. Use plain language. You can use terminology, but express yourself in a way that is understandable for everybody. Don’t assume that your users know what you’re talking about; it’s better to over-communicate than to speak in a slang no one actually understands. Create an intuitive structure and label the materials so that the courses are easy to find and their order makes sense. Make sure you unify the formatting of all the documents – this gives a good impression and it helps the users to orientate. As we were saying in the beginning, nowadays people expect you to give them an easy access to information. The good part is that you don’t have to create any new content; you already have all of the information locked in databases, documents and minds of people in your company. What you need to do now is to organize it into a well-structured rich knowledge base. Apart from the tremendous benefits of giving your customers what they seek, giving your employees the opportunity of self-paced training, reducing costs and improving SEO, your knowledge base actually makes your entire company more productive – and that translates into a more agile and competitive business. Start building your knowledge base today! 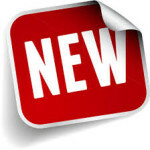 Training-Online.eu: new generation e-Learning platform. We are proud to announce that we have implemented this brand new lesson type. Teachers and trainers can now upload Microsoft Powerpoint and Open Document Format presentations to their lessons, and make the study material more appealing to students. Microsoft PPTX and OpenOffice ODP files are uploaded with their native behavior, which means, among other things, that any animations or videos that you might have inserted to your presentation will be preserved on our platform as well. This is also one of the biggest advantages of this lesson type compared to a PDF lesson: previously, if you converted your presentation to a PDF and then uploaded it as a PDF lesson, your users couldn’t watch the videos included. Now, with our Presentation lesson, they are free to watch the videos and animations in the learning content. Having implemented the Presentation lesson type, Training-Online.eu is becoming one of the most comprehensive e-Learning platforms on the market. We allow our users to study from their homes, but also to combine self-study with lessons in Virtual Classrooms. We provide online and blended learning, but we don’t only focus on developing new lesson types: OnBoarding, HR processes, education, building the company’s know-how, increasing the competitive advantage – whatever it is, Training-Online.eu has a solution. Now it’s a great time to try it. Keep pace with 21st-century innovations and start training people online today! Over the last few years, e-Learning platforms have been popping up all over the world. Companies have been using them to train their employees, as they present a great solution for busy students and bring new opportunities, such as studying whenever and wherever you want to, learning from someone on the other side of the world or using all sorts of mobile devices to learn. In 2015, e-Learning market size was valued over $165 billion and is likely to grow at over 5% from 2016 to 2023, exceeding $240 billion. Training-Online.eu presents a new generation cloud service, providing e-Learning and OnBoarding solutions for small and medium businesses, educational agencies, schools, startups and NGOs. We focus on the European market and the EU as we believe that e-Learning will be becoming very strong in this area in the years to come, but we have clients from many other countries as well. 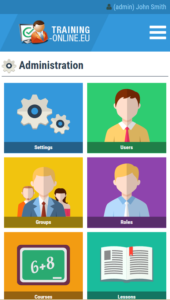 Be the admin: Training-Online.eu is incredibly easy to use. Setting up the LMS can be done in a minute, and according to our experience, anyone can do it (there is no need to invite an IT technician to do the job). It is a cloud app, easily accessible by anyone. All you need to use our platform is an Internet browser and a mobile device. Before Training-Online.eu, you needed a trained specialist to solve the problems related to the use of the e-Learning platform – that is, if you could afford one. With Training-Online.eu, anyone in your company can be the platform administrator and you don’t even have to pay. 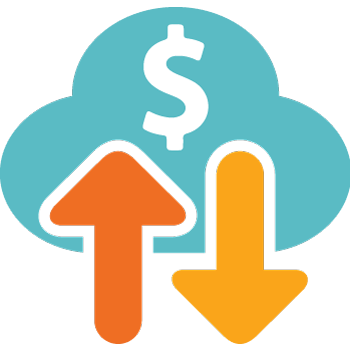 Pay as You Go: Our unique “Pay as You Go” pricing model allows the users to use our professional e-Learning solutions without any financial commitments. We have FREE solutions for institutions that require zero costs for their e-Learning system. Later, if the users are satisfied and choose to pay e.g. for some additional types of lessons, they can do so still without committing to any regular payment. Multilingual: Want to set up your platform in another language than English? Don’t worry: you can choose out of 16 languages or change the system language later. Also, each user can choose their own language. Czech, Danish, English, Finnish, French, German, Greek, Hungarian, Italian, Norwegian, Polish, Portuguese, Russian, Slovak, Spanish and Swedish are all available. We’re planning to add more European languages in the future. Wide range of lesson types: Have a creative way to teach your students? Great! Our platform offers a vast variety of lesson types. You can create surveys, announcements, and most importantly upload all sorts of formats: there are PDF and eBook lessons, video lessons, SCORM learning packages lessons, Virtual Classroom lessons (where people can cooperate in a videoconference) and, as our latest innovation, Presentation lessons as well. Now it’s a great time to try it. Start training people online today with our FREE e-Learning platform! We hope you will find these new features useful and helpful while working with our e-Learning platform. We will continue improving Training-Online.eu according to the suggestions and needs of our clients. We would also like to be able to respond to any special request of yours. To that end, we invite you to send us your recommendations or to visit our Forum and post your ideas there. We are happy to inform you about the upgraded version of Training-Online.eu. In this version we present the option to view your courses even after their completion, new file upload features, Skins upgrade, new enrollment forms and much more. 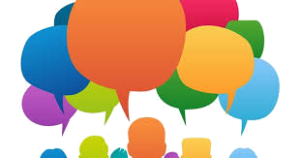 We have listened to the voices of our customers saying they need more data space to upload large SCORM, pdf and video files at lower cost. Therefore we have decreased the price by 77 %. Now you may extend your data storage and store more content. Previous version of e-Learning software Training-Online.eu didn’t allow the users to view the content of the course once it was completed. However, many users of our e-Learning platform expressed that they would appreciate the option to see the course content even after the course completion. We decided to comply with this request: all content is now available to open until your course due date is reached. You may access the content even in case you failed to complete the course, continue to study and get ready for next test trial. To simplify the process of creating and designing your e-Learning lessons, we have implemented a functionality that allows you to replace a file with another one. We didn’t allow this before to ensure proper functioning of the Course versioning service. We have reworked the file upload and the Course ID changes every time a file in the lesson is replaced. We believe this saves the admin’s time. The option to download the certificate preview has been added. It allows you to see the preview in full screen in the browser and view the certificate in detail. While creating the certificate, you may check it in full screen at any moment. With our latest skins upgrade, you can add your own favicon to the website (small logo in browser tab). We have finalized the personalization; once you add your favicon, there’ll be no doubt for your students that the LMS is a part of your website! The list of courses now contains Course ID so you can recognize your courses easily. You may now be pretty sure that you are assigning the right content to the right user and don’t have to disturb your users with more enrollments and to explain over and over again which course they should study. Last user login information has been added. We do believe this will help you organize your user support better as you’ll have more information about the activity of your users. The system navigation has been improved. You may use the breadcrumb navigation and move within the selected path or use the “Back” button we have added to all actions now. Training-Online.eu is proud to present a brand new lesson type. Teachers or trainers can now get in direct touch with their students, watch them react to the lesson in real time and respond to their questions immediately. 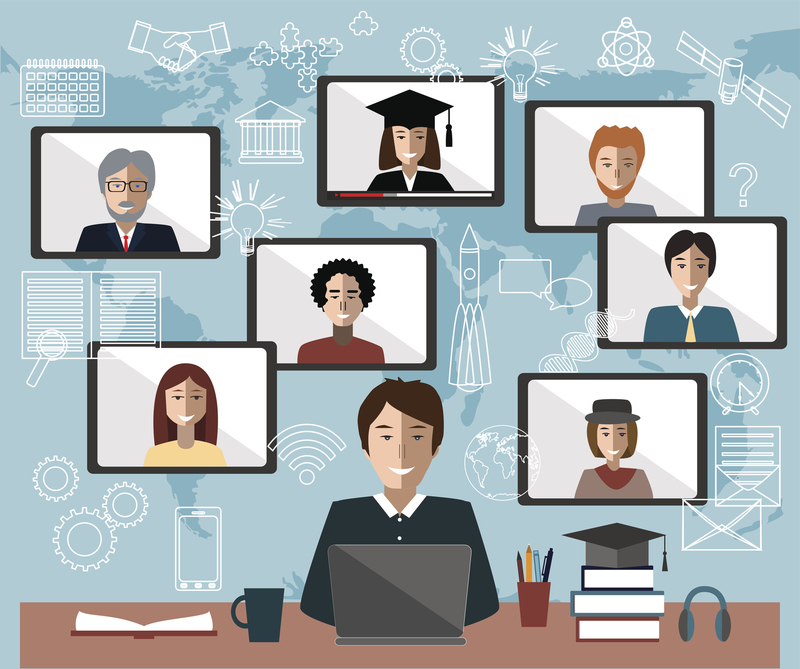 A kind of educational videoconferences, our Virtual Classroom is a great way to bring e-Learning closer to the traditional classroom education while increasing students‘ attention. After joining a conference in Training-Online.eu’s Virtual Classroom lesson, the participants can see each other in real time and talk. If students struggle, they can share their screens for the teacher to see what the problem is. Students can also communicate among themselves, sharing their notes and helping each other. Teachers or trainers can see how much time they have spent in the lesson and they get direct feedback in real time. How are Training-Online.eu’s Virtual Classroom lessons different? They are user-friendly and intuitive. To create or attend a Virtual Classroom lesson, you don’t need to install any plugins, additional software or browser extensions. Training-Online.eu’s Virtual Clasroom lessons are based on a new technology heavily supported by Google: WebRTC, a project which aims to enable rich, high-quality Real Time Communication applications to be developed for the browser and mobile platforms. Needless to say, our Virtual Classroom lessons work perfectly on mobile devices and they run on all modern browsers and platforms: Google, Firefox, Opera, Android and iOS. As insinuated above, another significant advantage of our Virtual Classroom lessons is that all participants of a video conference can communicate with each other. In other words, not only that the students see and hear the teacher, but the teacher sees and hears the students as well, and the students can also communicate among themselves. Although this might seem like an obvious thing, many e-Learning platforms actually only provide for the teacher to talk, while students can only listen to the lesson. In Training-Online.eu, everyone can actively participate in a videoconference, and the number of participants is not limited in any way. This makes virtual lessons comparable to traditional classroom learning. We’re expanding the options for blended learning: to attend a typical classroom lesson, students now don’t have to be actually present in the classroom physically. In our Virtual Classroom, typical face-to-face classroom activities can be performed while augmented with digital tools. What’s more, students can now be taught by trainers and professionals from very distant places who wouldn’t otherwise be able to commute and wouldn’t accept to teach in that particular course. Virtual Classrooms can also be used to supervise exams and proctored tests. We believe that Virtual Classroom videoconferences will be a great tool for the users of our e-Learning platform. It is yet another effective and fun way to learn and we are pleased to see that our new lesson type is showing great results. 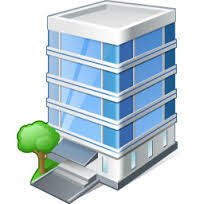 In the future, we plan to continue developing Virtual Classroom and adding new functions to it. Our next goal is to enable users to record the video stream so that students can see the lesson again later. Recorded videoconferences can also be used to create webinar video lessons. Training-Online.eu brings a professional LMS to small and medium businesses, training agencies, coaches, non-profit organisations and schools. It is a platform where no commitments or fees are needed. Using the Pay-as-you-Go model, Training-Online.eu is changing the face of e-Learning. There is also a FREE plan. Catch up with the 21st century trends and do your trainings effectively! Training-Online.eu introduces a cloud LMS for small and medium businesses. It has always been complicated for the small and medium businesses to be able to pay for their own LMS. Now, Training-Online.eu is introducing a cloud LMS that any company can afford. The trend of adopting cloud is getting stronger both among big corporations and small businesses, and it’s especially convenient for the latter. Thanks to the cloud solutions, the clients can save money and still push their business towards a modern way of training their employees: online learning. How so? Without having to purchase servers and avoiding other infrastructure costs, small businesses can focus on their core activities instead of investing in hardware. Besides, companies which decide to run their own data centers usually don’t fully utilize their servers and waste energy. 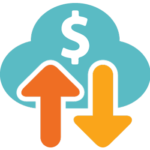 A cloud service provider charges companies less for the energy they use. This was already insinuated in the previous point and it is one of the main reasons why so many companies are nowadays shifting to cloud e-Learning solutions. But cloud services in general tend to be used not cost effectively. On cloud platforms such as Training-Online.eu, clients do not pay any regular fees; they only pay for what they actually do on the platform, and if they don’t visit it for several weeks or months, there is no charge for that. This revolutionary pricing system helps small and medium businesses to start their own LMS even if they have a very limited budget. If a business decides to use a cloud e-Learning platform, the only thing they need to do is to register, insert their courses and their users. With Training-Online.eu, that can be done in less than a minute and anyone can do that. Other solutions usually require calling IT experts who set up the LMS for the company and enroll the users to the course. Sure, big corporations can afford to do that, but such an expense was unthinkable for small and medium businesses for a long time. With Training-Online.eu, even small businesses can afford to set up their own LMS. Moreover, users can try the Training-Online.eu App out for free and without committing to anything. Training-Online.eu provides an intuitive SaaS (software-as-a-service) solution built on a cloud platform that definitely improves the quality of employee training and makes the overall organization of e-learning easier. The improvement of the employee is being monitored overtime, so the employers can adjust the training programmes to their employees‘ specific needs and make the training more effective while saving money at the same time. Having said that the adoption of the Training-Online.eu e-learning platform is easy, quick and anybody can do it, it is now easier to understand why this could finally be the affordable LMS that the medium and small businesses have been waiting for. Another big advantage is that there is a possibility to try the platform using the Free Study Plan; that is, using it for free. This is especially convenient for NGOs and startup projects, but all clients can use the Free Plan, see how the platform works and what possibilities does it offer, and if need be, later they can start using the paid plans, should they see them as profitable. Subscribing to an e-learning system and having to pay for it from the beginning has often been the thing that was holding small businesses back from setting up their own Learning Management System; now, Training-Online has removed this obstacle and the fast-growing e-Learning industry can finally reach the small and medium businesses as well. An unquestionable advantage of e-Learning is its flexibility, as users can access the platform anytime from any mobile device. This aspect is especially relevant for people who live in a world where mobile phones, tablets and headsets never leave their side. No wonder that more and more mobile learning tools and platforms emerge. Training-Online.eu also supports microlearning – that is, designing very short learning nuggets with a focus on performance. In this way, busy users can use their mobile devices to access these bits of information and learn anytime. Training-Online.eu believes that medium and small businesses will use this new opportunity and that it will help them to grow in a world where e-learning has become so important. We hope that the improvements we made will be perceived positively and that the LMS will be used in many companies‘ human resources and development processes. Ready to use the chance and start develop your team skills to improve your results? We are happy to inform you about the upgraded version of Training-Online.eu. In this version we bring the Certificates, Learning plans, SSL security upgrade, easier login and much more. Many users of e-Learning platforms appreciate the option of getting a certificate once they successfully finish the course. Now the brand new certificate editor has been added to your LMS. You may find it in the Course or Lesson module under the Certificate tab. To create a fully personalized certificate for each user, you may use the predefined backgrounds or insert your own, you can add texts, images and system text variables. The certificate may be downloaded by the user or sent as an automatic system notification to each user after they finish the course. To simplify the process of content enrollment to various groups of students, we have added Learning plans. They are groups of courses or other contents that you can enroll to specific student groups. This way you can be sure that you didn’t forget any of the courses and you stick to your learning plan. To maintain a high security level, we implemented SSL security to your elearning app. We feel that the Internet is full of dangerous threats and we wanted to ensure that Training-Online.eu cloud learning management system is providing a secure access for you! We automatically provide an SSL certificate to all the websites that are using the generic address mycompany.training-online.eu for free. To run Training-Online.eu on your domain (e.g. : mycompany.mydomain.tld), you use your own SSL certificate. Additionally, we have simplified the reporting system both for the users and the admins. Until now, it was only possible to set up a certain time limit for finishing each lesson. This new time tracking extension allows you to set up also a time limit to answer every attempt and reset the timer. This way, you can prepare users for regulatory exams as they may to make the mock exam in your system and then go for the final exam. All the lesson types are now tracking the user activity. If there is no cursor or keyboard movement during 5 minutes, the system will shut the lesson down. This feature is meant to prevent that the user leaves the lesson and the lesson exhausts its time limit. To make the log in process easier we have added the option to use your email address as a username. You now have 2 options when logging in, either the username or your email address, both working great. We hope you will find these new features useful and helpful while working with our platform. We will continue improving Training-Online.eu according to the suggestions and needs of our clients. We would also like to be able to respond to any special request of yours. To that end, we invite you to send us your recommendations or to visit our Forum and post your ideas there. In this frequently discussed topic, there are several aspects to consider. How can we achieve the greatest possible efficiency in informing the students of new contents, their assigning to a course and deadlines, while at the same time keeping the efforts and costs at a minimum? In Training-Online.eu we asked the same the same question. In e-learning, the solution seems to be to automate the communication maximally through sending e-mails with personalized information to the users. In this way, the students receive a perfectly clear message with exact contents and are pushed to fulfill the task. As for the administrator, the automation is completely effortless and thus it saves both time and money. That is why at Training-Online.eu we focused attention on the area we called Notification – the possibility of electing and sending any message based on default system events, such as for example assigning a student to a course or a notice about expiration of a course. The notifications can be set flexibly and sent to the students, the team leaders/initiators of activities and the administrator. While creating the message, it is possible to make use of dynamic variables such as for example the name of the user, the name of the course, deadlines, dates of sending the message and other conditions. In this way, for example, it is possible to inform the student about the deadline for fulfilling a task every day during the last seven days before the expiration of the course. Consequently, the student is much more focused on fulfilling the content and more likely to carry it out. Let your users be well informed and achieve a higher level of knowledge! The most recent trends in education, mobility and e-Learning systems define a whole new approach to the purchase of online learning systems. There are a lot of things to consider. When choosing an e-Learning solution, the users need to take into account aspects such as the speed of putting the system into operation, its user-friendliness or whether it is accessible from any device. And of course, it is very important to consider the cost of such a solution. If there is an institution with an environment that requires ZERO COSTS for the e-Learning system, Training-Online.eu provides the perfect solution for them. The schools, universities or non-profit organizations and also companies can now use this e-Learning platform for free thanks to the Free enrollment plan, which enables the users to work with three standard lesson types: pdf, video and SCORM 1.2. All of the lesson types can be used for online education, reporting and testing the users with SCORM packages. The teachers can insert their own lesson content to the Free online learning platform. They can create a new one or they can re-use some of the material they already had (e.g. presentations, videos etc.). The lessons can also be prepared during grant educational programs; either way, the eLearning platform runs for free. The system can be created, filled with data and set up for use during a few minutes. This decreases the costs for implementing the LMS platform considerably; in fact, there is no need to ask an IT department to implement the system. It is not necessary to connect it with the school network in any way. Training-Online.eu is a cloud app and the users can access it immediately. All you need is an Internet browser and any mobile device. This flexibility enables to implement the free e-learning platform in a very short time; all you need to do is to add new users and your content. Furthermore, this free e-Learning platform Training-Online.eu supports the idea of teachers administrating the lesson contents and the users‘ enrollments as well. The users can follow certain learning plans, they can search the courses themselves and enroll themselves to them. Training-Online.eu also provides detailed reports about all the users‘ results and their improvement and automatic e-mail notifications to all the users. All these features make the use of this free online educational system easy both for the teachers and the students. It is possible to personalize the platform with the school’s logo and colors, or to use the same colors they use on their web. That way, the users will perceive the platform as a part of the school system. 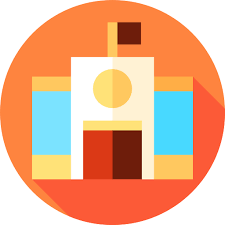 There is also the possibility of setting up their own domain and subdomain for the schools, which obviously improves the general user experience. Not surprisingly, Training-Online won the 2016 Great User Experience Award. Do you want an additional profit? Last but not least, the school may get an additional income by starting its own public e-Learning marketplace: a Free e-Shop for courses. Any course or lesson content can be displayed in an e-Shop by the users, so the passers-by on the Internet can buy it while the schools earn money without having to do any extra work. We are happy to inform you about the upgraded version of Training-Online.eu. In this version we bring the simplification of platform management, languages extension, SSL security upgrade and easy way to refill your credit. To simplify the education management, we have added this feature which allows you to add more courses into one learning plan and assign that to the user instead of assigning the courses one by one. Learning plans are especially useful if you are working with different user or employee groups. Usually each group has different training or onboarding needs. Using learning plans, you may build a specific set of trainings and contents for each group. When a new employee comes to a group, you can just assign them to the corresponding learning plan and be sure that you didn’t miss any of the courses necessary for them. It is yet another way to make the Enrollment process faster and more effective. We added Scandinavian languages to our system dictionary. With Swedish, Norwegian, Finnish and Danish now available, you can choose out of 12 languages while setting up your system language. This list shows all the languages you can set as your system language. You are free, however, to create courses in any other language not included in our language pack. You can also label the course as written in such a language (e.g. Japanese, Hungarian, Greek etc.). This can help you, for example, to sell it faster if you decide to display it in your eLearning platform e-shop afterwards. As Training-Online.eu follows the latest security standards, we have installed SSL Security Certificate on our sites and the e-Learning platform as well. You may have noticed that the application protocol has changed to HTTPs and your web browser now shows a padlock or green bar. The SSL Certificate is automatically installed to your subdomain once it is created, so you don’t have to make any extra effort to keep your data secure. Just fill your Wallet by sharing completed courses status to social media. Each student is allowed to share his results and achievements to social networks and get the credit back to the system wallet. Training-Online.eu was recently reviewed by FinancesOnline.com, a webpage that evaluates products and services and publishes customer reviews and reports from experts. Their website is a reliable source of information for business owners who search for solutions that would let their company grow. • 2016 Great User Experience Award. This certificate is granted to user-friendly products that are especially easy to use thanks to their well-designed interface. • 2016 Rising Star Award. FinancesOnline.com gives this award to SaaS products that are new on the market, but are already getting good customer reviews and are generally viewed as an efficient service. In their review, FinancesOnline.com pointed out the obvious advantage of Training-Online.eu’s cloud-based structure: there is no need to invest on hardware or software licensing to make it work. They also appreciated the efficiency of testing the knowledge and skills of the users and employees and praised the possibility of creating and administering internal surveys. Last but not least, they emphasized the benefit of multiple language support which allows companies to deliver materials to their employees in their preferred languages. English, German, Spanish, Portuguese, French, Russian, Polish and Czech are all available (other languages in progress). Our service was also listed among leaders on FinancesOnline top learning management systems list. We accepted the awards for the online LMS software category with great satisfaction and pride as we strive to meet the expectations of our clients and never stop improving our platform. It is a great delight to be awarded for our efforts. We would like to express our gratitude towards FinancesOnline.com for their recognition as well as to thank all the customers for their reviews. We promise to continue working even harder to facilitate the use of Training-Online.eu and to create an e-Learning platform which would suit perfectly to the purposes and needs of our clients. We would like to be able to respond to any special need or request of our clients. To that end, we invite you to send us your suggestions and recommendations or to visit our Forum Development Requests and post your ideas there. See more on www.training-online.eu or register here for free and get a free credit of $30. Should you have any questions, do not hesitate to contact us at support@training-online.eu. In Training-Online.eu, we strive to help your business grow. We are happy to inform you about the upgraded version of Training-Online.eu. In this version we introduced a new course type and a variety of new reporting features. The Course View mode was upgraded to show all the courses colored according to the phase of completion of the course. The colors are used in the same way as in the calendar you can find on My Study page. We introduced the “Free Course” lesson type to enable all users to use our LMS platform without any cost. The Free Course contains three other lesson types: pdf, video and SCORM, and it can be used for either testing the users or teaching. See the course types comparison in the pricing page. Use the Free Course for unlimited number of users or enrollments! 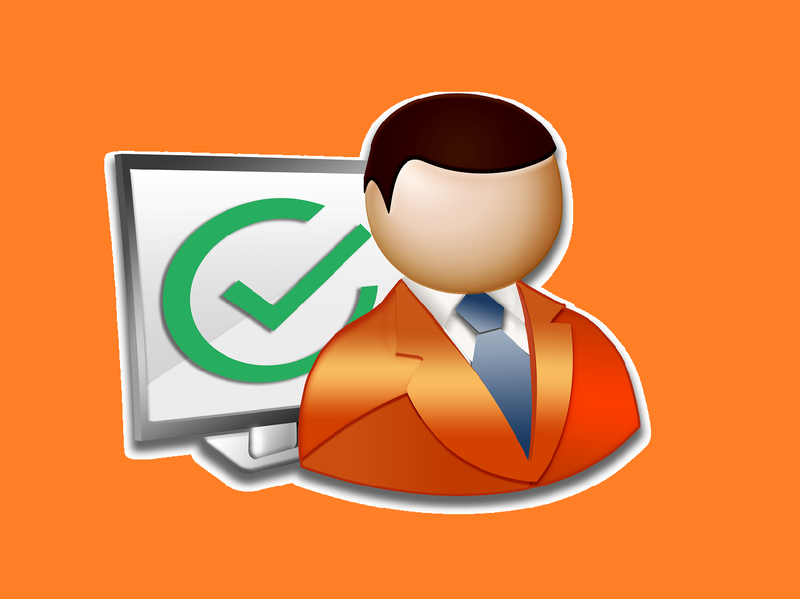 We extended the reporting capability for SCORM 1.2 content packages. It is now possible to see the concrete answers of the users, analyze them and learn from them while creating the next course. Training-Online.eu’s detailed reports can be exported in csv or xls format for future data analysis in the spreadsheet editors where you may set exactly the data view you need for your next study material preparation. We hope the new and improved features of Training-Online.eu platform will fit your purposes and needs. As always, we thank you for your support and invite you to send us your suggestions, requests or recommendations. 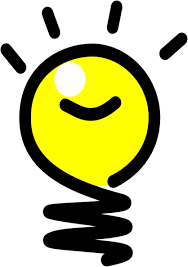 To that end, do not hesitate to visit our Forum and post your ideas. Gain more customers and increase your profit by exposing your courses in your e-shop! 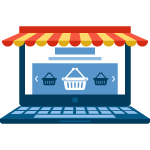 Having an E-shop is one of the most helpful and increasingly important things for your business. Since more people get comfortable with the Internet nowadays, the power and influence of e-commerce is growing stronger. The Internet is a wonderful device which enables merchants, companies and industries not only to sell their products and services, but also to promote them easily, and make them more visible. In Training-Online.eu we thought that it would be nice to make it possible for you to make even more use of this online environment’s opportunities. We would like to help you to make more profit from your online courses and raise people’s awareness about your business. That is why we decided to develop a brand new part of our platform: an E-shop where you can publicly expose your online courses = Elearning marketplace. For most businessmen, starting an E-shop means an investment. Depending on what your end goal is and how much money you are willing or able to pay to make your online business and products visible and easy to find, the expenses for an E-shop can vary from a few dollars to a few thousands. Having an E-shop at Training-Online.eu, however, won’t cost you anything. All you have to do is to turn the function of E-learning marketplace on and insert your courses. Another free function we bring to you is a possibility to incorporate the e-shop easily to your own webpage so that your customers would recognize it and use it without fear. It’s up to you which of your courses you want to expose publicly. But remember, the higher is the number of courses in your E-shop, the bigger are the chances for gaining new customers and increasing the number of your web page visits. You also can (but don’t have to) add the logo of your company to your new E-shop. This way you personalize the page and help your users to recognize you immediately. We have mentioned already that in Training-Online.eu we are aware of mobile devices being a part of our daily lives. We don’t turn a deaf ear to the fact that people are increasingly accessing the Internet through mobile devices, social media has gone mobile and the traditional mass media are being replaced by mobile technologies. That is why we strive to make every new function and element we add accessible from a mobile device, too. The E-shop is not an exception and the function is designed to run not only on your computer, but also on your tablet, mobile phone etc. When you think of that, there are really not many ways we could make it easier for you. Using a new virtual space, you can increase the chances to gain more customers and raise your profit so simply. It’s free and just a few clicks away! Use the online courses you have already created and put them in your online-shop to help people to find you. Start an E-shop and let the world see your courses! In today’s world of advanced technologies and online communication, e-Learning is a fast-growing trend. The flexible nature of online education and the advantages e-Learning can provide are becoming recognized not only by companies and organizations, but also among the general public. With online education, the need for travel is eliminated, as well as all the costs related to classroom-based training. The students (your employees) have the possibility to study whenever, wherever and on whatever device they choose, and at a pace that is convenient for them. Thanks to the feedback and student testing, educators can adjust the lessons exactly to their target audience. There is no need for printed materials and traveling. Allows you to facilitate the communication with your users, students, employees, business partners, etc. The distribution of announcement and internal policies has never been so easy and effective. These are just a few of the reasons why so many companies started to use an e-Learning education system. We have already implied the importance of adapting the lessons to the students´ needs and focus on the areas that cause them problems. To do that, first you need to know which are those problematic areas and how well do your students, employees or users understand the topic. In other words, you need to test your students‘ knowledge. To do that, Training-Online.eu offers you a large variety of learning and testing tools. Thanks to our editors it is possible to create any type of test, from short and simple ones with only one possible answer to rather complicated ones, with different possibilities to answer them. It all depends on you. Let’s have a closer look at the ways you can test your students. This type of testing analyses your employees’ feedback and defines the difference in the skills required on the job and the actual skills and knowledge possessed by the employee. In other words, it allows you to see which topics and areas you need to focus on as an educator (as they seem difficult to understand for your users, students or employees) and thus to adjust your lessons to your employees‘ needs and make the whole education and training process more efficient. e-Learning platform Training-Online.eu allows you to create tests with various answer schemes: one correct answer, multiple correct answers, yes/no type of test, matching the correct answers etc. 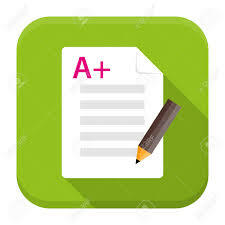 You can also use SCORM to help you create quality tests structured according to your design and to permit the learner to “bookmark” their progress when taking breaks or access the test scores easily. At Training-Online.eu we believe that the best way to improve your services and make your business more effective is to ask your employees, students, business partners and colleagues for feedback and analyze their opinions. That is why we give you the opportunity to create any kind of survey you need to gain valuable information from your target audience. Apart from all the advantages and possibilities our system provides, it is extremely easy to use. Training-Online.eu is based on intuitive use and thanks to the video tutorials added to each of the key chapters of the E-Learning Management System use, both the students and the administrators will quickly understand how the system works. There is also the possibility of using the Help icon while browsing the system or to ask for help in the Forum. By joining all the aspects, tools and possibilities mentioned above, a complex eLearning and eTesting tool was created that we believe to be both very effective and easy to use. With Training-Online.eu, you can test your employees, students or users in any way you need, get to know their knowledge and skill gaps, adjust the lessons to their needs and thus to make the whole training process more effective. Your users are happier and learning more while your costs are being reduced! Create your e-testing system today! Save your budget with transactional pricing in Training-Online.eu! We would like to show you an example of the calculation model we use to demonstrate the advantage of transactional pricing of Training-Online.eu. There is always a discussion about which type of pricing is more advantageous and brings you more freedom in terms of future cost, its predictability and payable commitments. Beside this illustration there also is the FREE enrollment plan in Training-Online.eu and the system may be run at zero cost. See the pricing >here<. Firstly, transactional pricing provides you a full control of future education costs and allows you to allocate the costs perfectly. This is regardless of the number of users, teachers or courses on your e-Learning platform and gives you more time to spend on other activities rather than cleaning the entries. Therefore you may keep even inactive users or content such as courses, announcements or surveys, and having a full statistics and entries still compliant with a legal legislation. Secondly, if there is no activity, there is no cost. This means your cost may be easily calculated and forecasted! Training-Online.eu is a lifetime e-Learning platform, it always remains accessible even if there is zero credit. Even if you do not perform any enrollment of new courses or other content, you don’t pay anything, and the study performance data are still available. In a traditional pricing model, when monthly subscription is paid, you usually pay for a package based on a number of users, teachers or courses in your system. This usually means you have to monitor those key numbers and make sure that your platform contains only up to date entries that will ensure you a proper price band. For 100 users the monthly cost usually oscillates around 300 USD. Even in case there is no activity in particular month(s) in competitive platforms, you still have to pay the monthly fee! If you are using the monthly subscription model, you can not consider interrupting your electronic education for some time for any reason. In case you stop paying because you want to optimize your costs, you lose the access and all your users‘ study performance data as this kind of systems simply doesn’t allow the interruption of payment. Then you have no other choice than just continuing to pay. You are trapped! If you compare the cost on 6 courses, Training-Online.eu is 79 % cheaper! 6 courses a year are not enough, you think? If you assign 12 courses a year, the user has to perform 1 training a month. Even with such a demanding training, Training Online is still 50 % cheaper than the traditionally priced systems. Don’t forget, you may still use the FREE plan and your running cost may be zero! Ready to save your budget? We have already discussed the advantages of the educational platform personalization here. 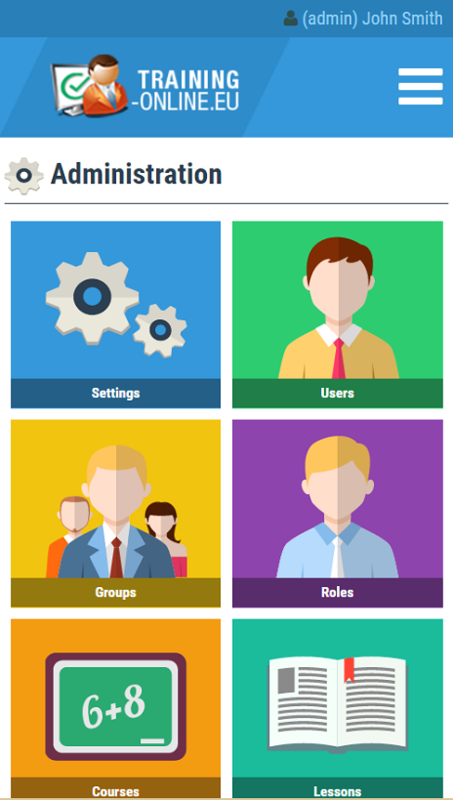 Now, we are releasing a new fully responsive eLearning SKIN for mobile devices. As the world of mobile devices is growing bigger every day and the number of users using their tablets and smartphones is increasing, it is a big advantage for them to be able to use the e-Learning software on any device at any place. Training-Online.eu is using the HTML5 web technology and the web application itself looks very similar to the phone application, we call it APP like – you can create the App icon on your mobile device easily. The platform engine and all evaluation criteria are located in our cloud farm, therefore it’s necessary to study the content online. This is the reason we have chosen the web browser technology. Don’t worry, it will not mean any noticeable difference for you and we’re sure you’ll soon grow to like the new material design FLAT SKIN. What does it mean like APP? 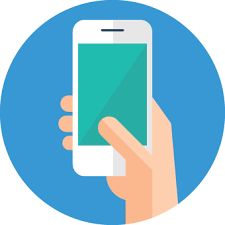 APP like (same like Application), which means that the user may create his own Icon on his mobile phone or tablet screen and access the e-Learning platform directly. The APP Icon then opens the platform directly, same way as any other APP Icon. FLAT GUI Fully Responsive Standard – this free skin is the standard predefined user interface, keeps our standard color and logo branding, and allows no changes. FLAT GUI Fully Responsive Logo – offers to place your own logo into the header banner. Our standard color scheme remains. FLAT GUI Fully Responsive Logo & Color – allows full flexibility to adapt to your logo and color scheme. At the moment, total 6 skin versions are available in the SKIN module to be chosen (3 for Icon gui skin and 3 for Flat gui skin). One of the key advantages of responsive e-Learning is the mobility. Imagine how faster and easier will the training be for all the mobile devices users: teams, employees, home users and many more. This new skin increases your chances to make the platform even more attractive for more users. Increase your profit by getting feedback! In Training-Online.eu we believe that getting feedback is important as it gives you a perfect insight into the way your services, products or employees‘ behavior are perceived in reality. Whether you get it from the inside (from your employees) or from the outside (business partners, suppliers or customers), it is always helpful. Working environment, conditions, processes, projects, initiatives and events may be a subject for a survey and the feedback you get may be used to change your business for the better, as it helps you to gain valuable information and new points of view. The proportion between the quality of training and your employees‘ performance is obvious: well-trained employees are more likely to work effectively, because adequate training with clearly determined goals and methods reduces frustration and stress from work and enables the employees to work faster and better. The best way to optimize your employees‘ training experience is to get feedback from them. As an employer, you should be able to adapt to your employees‘ needs to be able to create change from within. avoid using unpopular training strategies and methods. In a similar way, it is also useful to get feedback from your suppliers or customers. It is the easiest way to find out how happy they are with the quality of your services, products or your employees‘ behavior. new ideas about important changes from people you work with. That is why we bring you the possibility of making a survey among the people you train and cooperate with. Thanks to this unique option, you will be able to get feedback from the inside (from your employees) as well as from the outside (your suppliers, customers and trading partners). All they have to do is to fill in a questionnaire you design. To create a questionnaire, there is always a need for a tool (it would be rather complicated to conduct a survey by e-mail, for example), and Training-Online.eu now gives you this tool as a part of the e-Learning platform you already use. The survey results will be sent to you together with the results of other activities, such as online learning itself. To make things even easier, as soon as you assign people to a survey, we will send them an e-mail with a link to it. 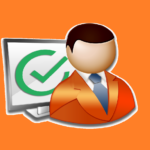 This gives them the opportunity to directly evaluate your training and other activities without having to search for the survey in our system, as well as it prevents them from making excuses, saying for example that the questionnaire was too hard to find or that they didn’t know about it. Don’t be afraid to see how people perceive your business and increase your profit by asking about areas for improvement. Create a survey to get feedback from your users today!